Please note: I saw this production for free on the courtesy of Helsingin kaupunginteatteri. 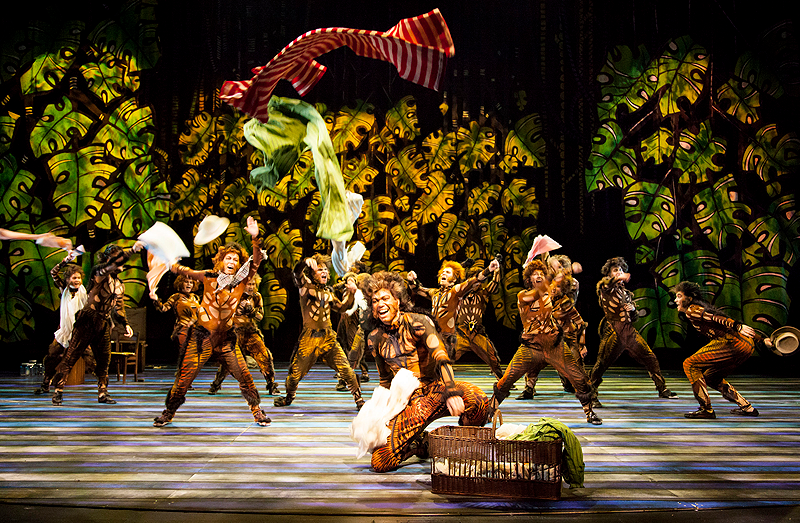 There is a bit of a jungle musical boom going on in Helsinki. 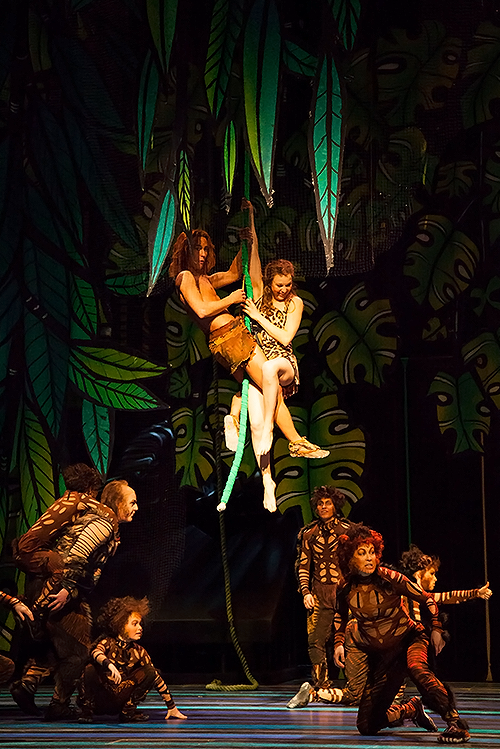 At the moment, two theatres are doing tropical shows: The Jungle Book is still playing at Svenska Teatern, and Helsingin kaupunginteatteri premiered Disney's Tarzan just last week. Yesterday, I got to see the show as a part of a special blogger event at HKT. When I think about the jungle, the first thing that comes to my mind is how beautiful it looks like. Tarzan didn't disappoint: the visuals were lovely to look at. Before the performance, we bloggers got to visit the stage and take a look at the musical's sets (by Katariina Kirjavainen). It was incredible to see how the rather uninteresting-looking mass of shapes we saw beforehand was transformed, with the help of the lighting, into beautiful jungle scenery during the show! I was really impressed by William Iles's lights. I feel the cartoonish sets would probably look too fake from the very front row, but from a bit further back in the auditorium, the sets and the lights together created a nice illusion of a tropical forest. The gorilla costumes by Elina Kolehmainen were also fun to look at. Actually, the gorillas in general were a lot of fun to look at: they did some really impressive dancing! Overall, this show was a treat to the eyes. Tarzan's path to adulthood is all about big emotions, but for a reason or another, I didn't really feel for the love story in between Tarzan (Saska Pulkkinen) and Jane (Elina Aalto), nor the relationship in between Tarzan and his adoptive mother Kala (Sanna Majuri). There were emotional moments happening onstage, sure. But despite the sympathetic performances, I didn't feel close to the main characters. Instead, my favourite character was Tarzan's gorilla friend (and adoptive brother/cousin/?) Terk. I was rather charmed by Matti Leino's performance. He made the character arrogant yet loyal and altogether a lot of fun. Also, I have to mention Kari Mattila as Clayton, the guide of the English jungle expedition group! He was a classic Disney villain: pure evil, greedy and blood-thirsty without a single redeeming trait – and as such, maybe surprisingly, a joy to watch. So far, so good... Unfortunately, one important part of the show didn't work out: this was one of those musicals where I honestly found myself wishing they wouldn't sing so much. The cast sung well, sure, but Phil Collins's tunes were awfully bland. There were a couple of highlights, but to my ears, most of the songs sounded the same. The ending of the second act with four reprises in a row... Yawn. The music had its moments: I enjoyed the bits with lots of percussion and exciting rythms (Trashin' the Camp, the song that began the second act, was a great number!). It's just a shame there were so many dull ballads in between those parts. Tarzan at Helsingin kaupunginteatteri was fun (apart from the music), but for me, nothing more than that. It was nice to look at but didn't make me feel any deeper emotions. Remembering it is a Disney musical, however, I guess I got everything I was expecting to get – a fun if not too memorable night at the theatre. By the way: HKT offers subtitles to Tarzan in Finnish, English and Russian. If you're visiting Helsinki and craving some culture, but your Finnish isn't quite fluent yet, here's a show to consider! Photos by Mirka Kleemola / Imagenary Oy. I also adored the lights and visuals. 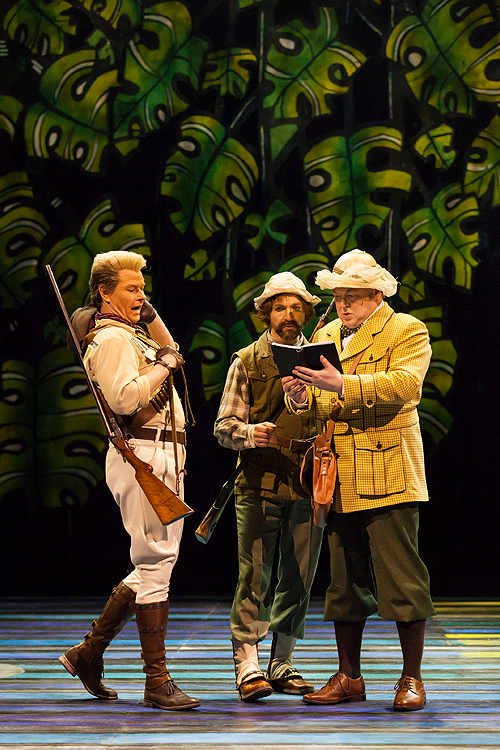 I think the jungle actually looked better like this than in the more realistic-like Broadway version. At least based on pictures. I also think that the possible lack in chemistry you described is partly because of the script. The animation was already a bit lazily done, if I may say so, and even good actors can't always save a not-that-good script from falling apart. And I think it's a shame as I think this production team could've done wonders with a proper script.